The entire North 58° Fleet and crew are fully commercially endorsed and available for commercial charter. 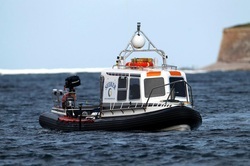 Filming, people transfer, marine surveys, monitoring and research are all within our capabilities. Full technical and consultancy support is given, with a range of boats, equipment, marine specialists, engineers and crew at your disposal. Skipper & Crew- all personnel are trained to the highest standard for commercial work. Used to working in challenging conditions and long hours. All personnel safety and medical standards are to MCA guidelines. Specialists - we have a range of marine, engineering and scientific specialists within our personnel, all trained to very high standards. Please contact us for further information and to discuss your vessel, personnel and charter needs.